Make the most of being a Goodwill Good Perks member! Be sure you give us your e-mail address & cell phone number! Adding a valid e-mail & cell phone number to your Good Perks account ensures that you will get special member only promotions you won’t want to miss! Ask a store associate to update your Good Perks account today. Are you looking to re-subscribe to Good Perks E-mails? This form is for Good Perks members who have unsubscribed from our e-mail list. 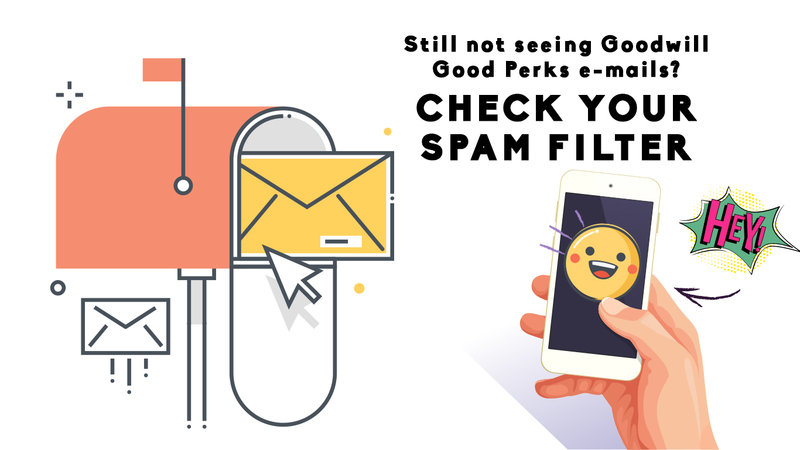 If you would like to start receiving e-mails again about exclusive Good Perks promotions, use this form and check your e-mail to update your profile. If you are not a Good Perks member, please visit one of our convenient store locations to sign up. Are you still not seeing Good Perks e-mails? Check your spam filter!